2 x Raspberry Cascade Delight - An early floricane variety (see explanation below) originally from USA, cropping from June/July for about four weeks. Cascade Delight's long fruit-bearing laterals make it an ideal variety for growing at home and harvesting by hand. 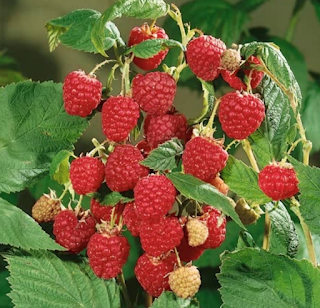 Very vigorous and reliably produces a good crop of large, conical berries with sweet red flesh. Cascade Delight is an ideal variety for planting in damp soil as it has excellent resistance to root rot. Height: Over 1m. 2 x Raspberry Tadmoor - One of the latest season floricane varieties (see explanation below). Tadmoor was bred in New Zealand and crops from late July right the way through to early autumn. It's spine free which makes picking easy, and it has strong, rigid stems and compact habit meaning it can virtually support itself. Height: Up to 90cm. 2 x Raspberry Polka - Polka is a special late primocane variety (see explanation below) from Poland which crops on both the new and old wood, making it one of the earliest and longest fruiting varieties, starting to crop from as early as mid-July and continuing right through until as far as October It's self-fertile and produces very high yields of the most exceptional quality fruit. It's a tough variety with good disease resistance and tolerance to poor soil, meaning it will crop very reliably throughout the summer. Height: Up to 1.5m.